La Grande Vie (meaning The Great Life) was initiated by two housing co-ops in Sherbrooke (Quebec, Canada) – la Coopérative d’habitation des Cantons de l’Est and La Coopérative d’habitation de la Rive-Gauche – so that their aging tenants could find the support they need while pursuing their cooperative lifestyle. La Grand Vie aims to offer a choice different from the for-profit private senior housing, closer to the values of cooperation those people lived with their whole life, i.e solidarity, education and democracy. La Grande Vie is a 54-housing unit co-op for autonomous seniors (aged 65 +) offering a secure environment and services supporting tenants who are aging-in-place. With a dozen or so committees and a board of directors run by senior tenants, it offers a stimulating and emancipatory living environment for engaged and energetic older people. La Grande Vie’s senior residents and executive director are currently working on a second phase of 36 units with services supporting convalescent or frail older people. Including 24/7 assistance and a home automation system, this second phase of development will enable frail older people to age in place, close to their loved ones and give them a chance to still take part in the co-op community. At the moment, those frail older people need to move across the city to find assistance in one of the much more expansive for-profit organisations or in hospital-like public institutions, tearing friendships, families and even couples apart. Residents say that the democratic governance of the co-op keeps them engaged and learning; in that kind of living environment, they feel useful and don’t fear boredom. How collaboration worked: La Grande Vie’s two founders, La Coopérative d’habitation des Cantons de l’Est and La Coopérative d’habitation de la Rive-Gauche are still engaged in the project, with the executive director of both co-ops sitting on the board of directors along with 5 tenants from La Grande Vie. Both co-ops funded the project, each injecting 50 000 $ in financial contribution for preliminary analysis and project development. 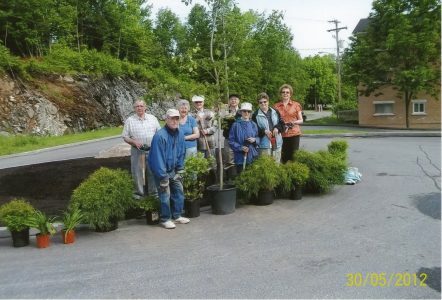 The city of Sherbrooke also helped; the city gave a plot of land, contributing up to 15 % of the total cost of the project. La Société d’habitation du Québec, the provincially owned enterprise in housing also funded the project through the AccèsLogis Québec program, a program that helps developing social and non-profit housing for targeted population group such as seniors or low-income families. This program subsidized 50% of the project cost. It also guarantees that 45 out of 54 housing units (those counting 1 bedroom) will be subsidised so low-income older people can benefit from the project too. A research team working on home automation is involved on the phase 2 project with professionals and a committee of tenants. Details on older people's involvement: The demand emerged from aging tenants of founding co-ops who wanted to age in a co-op but needed some help. An “aging tenants’ consultative board” was set up during the development of the project. Seniors are engaged in committees, in the maintenance as well as in the governance of the organisation, sit on the board of directors - occupying a majority of the positions (5/7), represent the organisation on local and regional housing or aging organisations and engage in care and support behavior. There is a Social Impact evaluation going on at the moment, the results should be known at the end of the summer (2018). Preliminary results are positive; older people like to have the opportunity to engage in the maintenance and the governance as long as they have the capacity to do so. They feel safe in a housing environment where they know their neighbors. They also appreciate the low cost of the rent and services, compared with the private for-profit sector. Yes, a second phase is in development, this time for older people who need more support (medical and technical) and monitoring to maintain their autonomy. The second phase implies a new construction adjacent to the first one, with 36 studio apartments. To support the autonomy of older people experiencing loss of capacity, the new apartments will be equipped with home automation installations. It will serve as a study site for Sherbrooke’s domotic research team DOMUS. This project will enable tenants to age in the co-op even if they need medical support, and not be physically separated from their spouse or friends, which is a big problem at the moment. The two executive directors of the founding co-ops were ignorant of the cost and functioning of housing with services and support for frail older people. If they were to do this again, they would reach-out for a partner specialised in the care and support of older people earlier in the development process. Their ignorance caused some difficulties in the first years, especially on the financial level. They would also plan more common spaces, allowing activities of a different nature to take place simultaneously, and a place for spiritual life and another for private family meetings. The biggest challenge La Grande Vie faced since its opening in January 2011 is supporting frail older people as long as possible with the limited services and infrastructure the project offers, trying to avoid moving them to a more medicalised institution. The implementation of phase 2, planned for mid-2020, will likely alleviate this challenge.